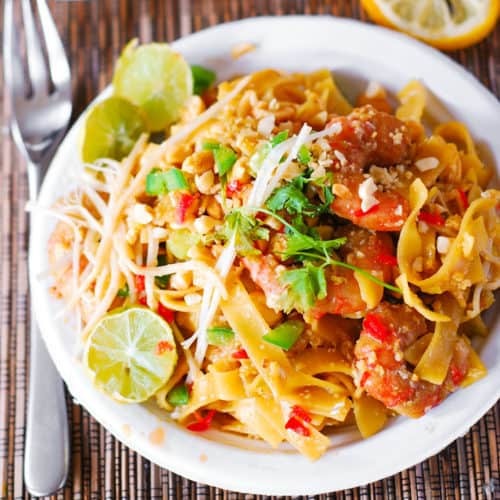 Pad Thai Noodles with Shrimp – make it at home! Homemade delicious sauce is made with fish sauce, honey, tamarind paste (or lime juice), rice vinegar and red pepper flakes. 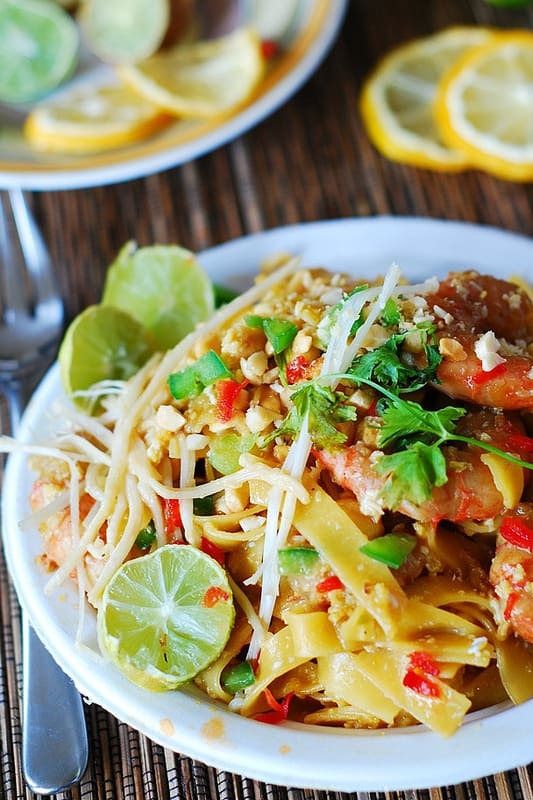 Shrimp Pad Thai is one of my most favorite Asian meals, along with Tom Ka Soup – Thai soup with coconut milk, red curry, lemon grass and Thai Red Curry Chicken. I’ve been making my own Pad Thai for the last 4 years now: it has become a staple meal at our house. We hardly even order Thai food take-outs any more. 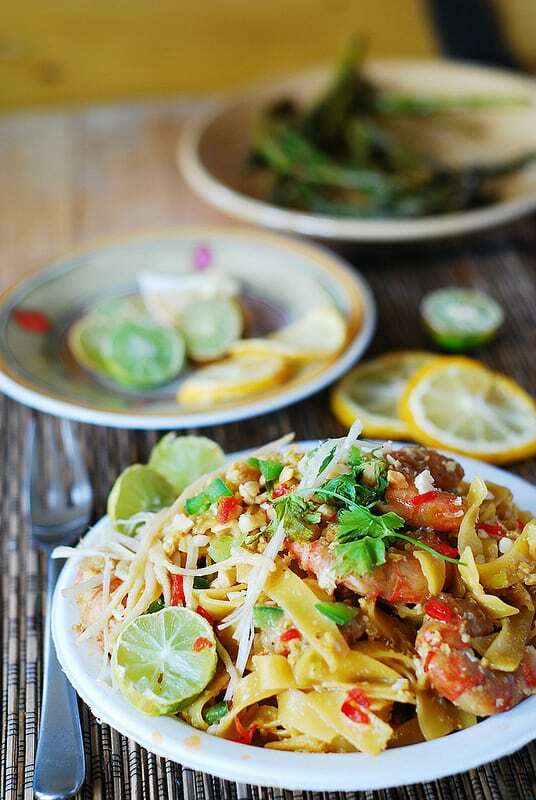 What’s nice about Shrimp Pad Thai is that it is so easy to make! Even the ingredient list is not very long or complex. First, you prepare a sauce by simply combining together fish sauce, honey, tamarind paste (or lime juice), rice vinegar and red pepper flakes in a small saucepan on medium heat. Next, you cook veggies in peanut oil, add eggs and scramble them, then cook shrimp. In the meantime the noodles are cooked according to package instructions. Then, you combine everything together: the sauce, veggies with eggs and shrimp, and rice noodles (or pasta)! Make sure the sauce coats the pasta, and that’s basically it! 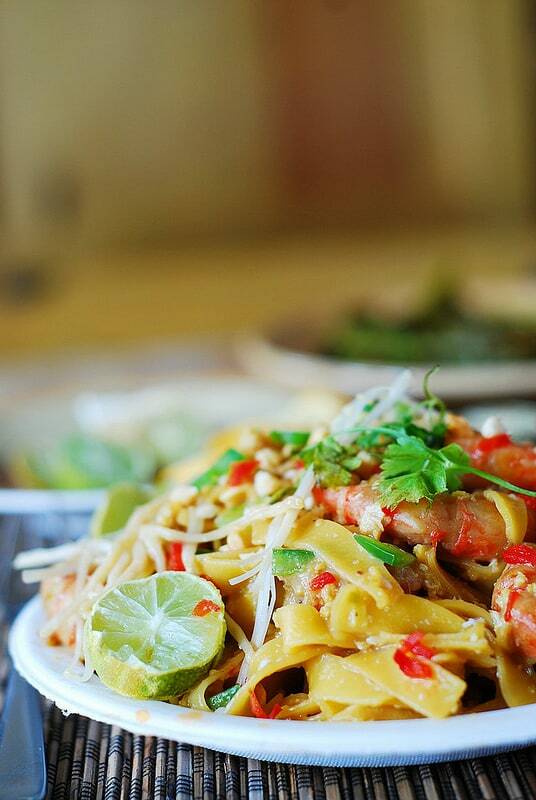 Nothing complicated in making Shrimp Pad Thai! I did provide the detailed instructions below, but the whole preparation and cooking process should not take more than 30 or 40 minutes! Especially on the second or third try when you’ll get the hang of it. 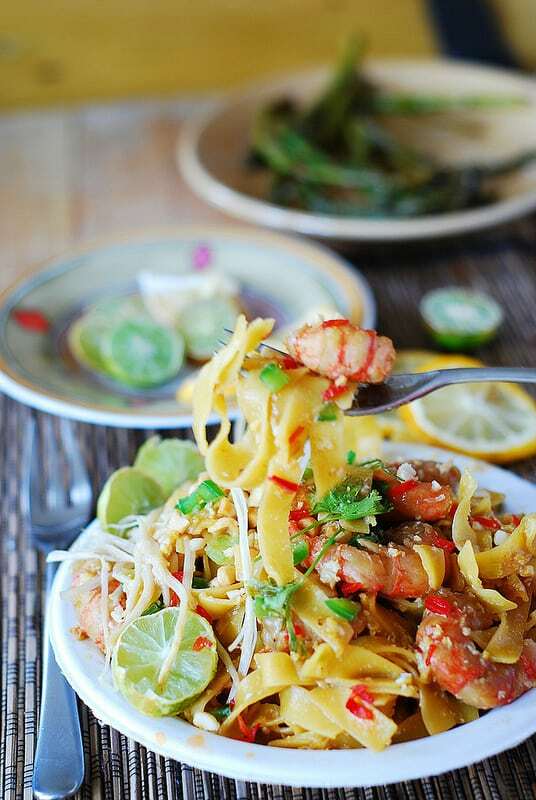 Pad Thai Noodles with Shrimp - make it at home! Homemade delicious sauce is made with fish sauce, honey, tamarind paste (or lime juice), rice vinegar and red pepper flakes. In a small pan, combine tamarind paste (or lime juice if you don’t have tamarind paste) with fish sauce, honey, and rice vinegar over medium heat until honey gets really soft and all ingredients are mixed. Mix in red pepper flakes. In a large skillet, heat 3 tablespoons of peanut oil over medium heat, add chopped green onions, garlic and cook for 2-3 minutes. Add eggs and scramble them until just done. Add shrimp and bean sprouts – continue cooking for 1-2 minutes, just until shrimp turns red. In the mean time, cook pasta or noodles according to package instructions. Drain but do reserve a good amount of cooked pasta water. Add drained noodles to the large skillet with eggs mixture, on low heat. Also add the sauce from step 1 and 1/4 cup of chopped toasted peanuts. Stir everything to combine well. Add a bit of cooked pasta water, if necessary, to make the sauce less thick and easier to coat the noodles. To serve, place 1/4th of Pad Thai noodles on each plate. Top each serving with remaining chopped toasted peanuts. 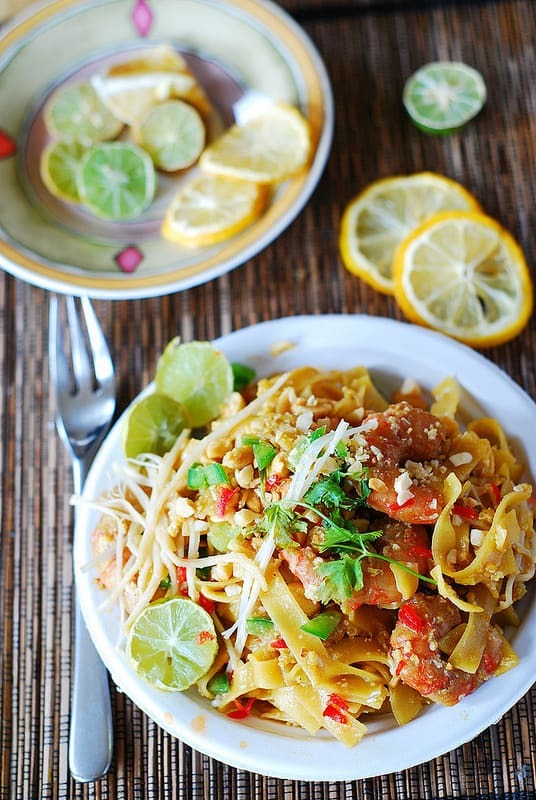 I love trying new Pad Thai recipes and this is our next! We love Pad Thai and Pad Si Ew! 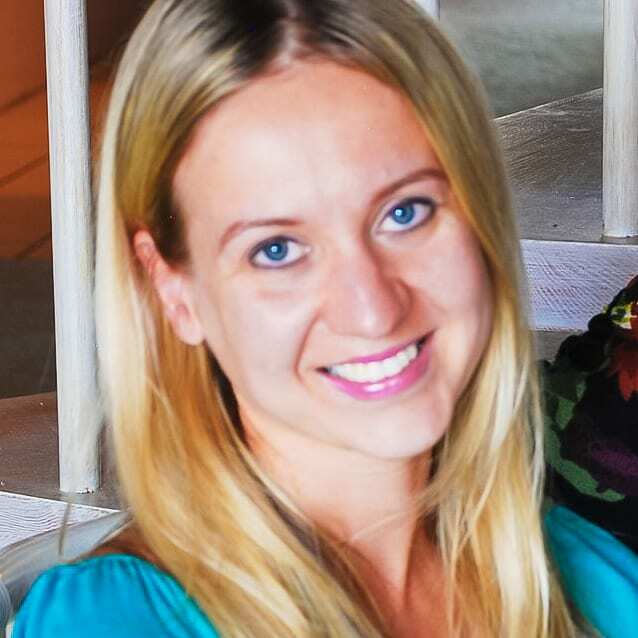 Such gorgeous delicious photography, Julia!